Based on the lettering on the front of the 1978 edition of the Scoutmaster's Handbook. Since the original sample only contained "ABCDEHKMNORSTU-", I had to design the rest from scratch. Info: Created on 5th August 2009 . Last edited on 8th August 2009. 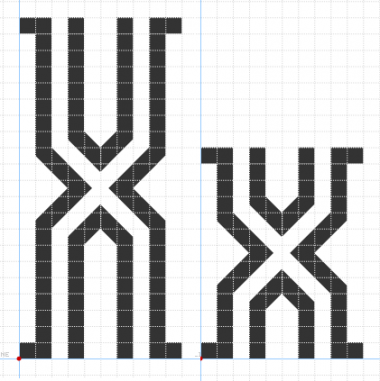 Only (very slight) quible ... the diagonals on the X and x look a tad thin. This is cool. I agree with p2pnut about the diagonals on the x and X. If you're willing to use brickstacking, you could do something like this. Congratulations! FontStruct Staff have deemed your FontStruction worthy of special mention. “Mouthcaster” is now a Top Pick.